. wadako 和凧 Japanese Kite - Kites with Daruma san . tako-e　凧絵 pictures on kites. It is thought that kite flying became popular in Japan in the 18c and the early designs for their decoration were hand-painted nikuhitsuga 肉筆画. Woodblock printed designs did not become popular for kites until the early 19c with Utagawa Kunitsugu 歌川国継 (1800-1861). In these first printed designs, the ink outlines were woodblock printed and the colors were added by hand. Printed colors did not become popular until the 1830s-40s. Few early kite pictures remain because they were made for use and naturally did not last many flights.
. beraboo tako ベラボー凧 kite with a face sticking out the tongue .
. Ezodako, Ezo tako 蝦夷凧 Kite from Ezo - Hakodate, Hokkaido .
. Kyushu Kites 九州の凧　My Introduction .
. sakazuki-dako 盃凧 kite in form of a sake cup .
. Shizuoka Kites 静岡の凧　My Introduction .
. Toojin tako, toojindako 上総唐人凧 Tojin kite with Chinese faces .
. yakkodako, yakko tako 奴凧 Yakko servant kite . Japan's kites are among the most spectacular in the world, treasured as much for the aesthetic worth as for the pleasure they give as toys. The traditional kite consists of a light bamboo or wood frame over which is affixed paper painted with various bold motifs, ranging from faces of legendary war heroes to brilliant geometric patterns; in the hands of a skilled craftsman, the Japanese kite becomes a work of art. Japanese kites are made in immense ones of over a thousand square feet, and in many different shapes. Many of them require considerable skill in handling if they are to be airborne successfully. Japanese kites possess a history of association with folk religion and figure in a number of famous military adventures. Today's kites are source of pleasure for this reason as well, for they draw upon, and to some extent preserve, traditional legend. Variety shapes of Japanese Traditional Kites are offered here after. The giant kites such as Shirone, Hamamatu, Sagamihara, Showa-machi(Hojubana), Ikazaki, Yokaichi and Wan Wan are shown on the page on Giant Kite Festivals in Japan. Kites hereinafter except Tsugaru kite have a single line and are made from bamboo and Washi (Japanese paper). The material of the frame of Tsugaru kite is made from white cedar (Hiba). This kite has a peculier shape comparing with other kites which were born in Fukushima prefecture, Northern part of Honshu island. It is believed that the origin of this kite came from Goto,Iki,Nagasaki where is located in southern part of Japan. After painting, the sail paper is painted with tan for strengthening its sail. This method is very peculier in Japan. The design of this kite means "Judge of Hell," the Devil in the heaven. This kite is a kind of Yakko and it has long legs which act as a stabilizer or tail for balance. "Ashi" means 'legs' , "Naga" means 'long' and "Yakko" means 'a servant' in ancient era. Many kinds of Yakko-dako are produced in in Shizuoka prefecture and among them, Ashinaga-Yakko is most outstanding Yakko. This kite is said to be transferred from east Asia, such as India, Malaysia and Indonesia. The shape of this kite is very unique and not so popular in Japan. This type of kite is made at Hirado, Iki and Goto islands in Nagasaki prefecture located in southern part of Japan.This kite has an hummer on it. The design of the kite is that Damon bites the helmet of old soldier, Samurai. BEKKAKOU has a humorous look and needs a tail to get a stable flight. This type of kite is originated in Yokosuka district, Shizuoka prefecture which is famous for having a variety of kites. The eyes of this kite is painted with silver color and has a rotating mechanism with the wind. BUKA is one of the fighting kites and the fighting technique of BUKA needs skill and experience. It has two bridles and has no tail. The birthplace of Buka is Shizuoka Prefecture. There are so many kinds of kites in Shizuoka, Japan. BUTTERFLY kite is not so popular in Japan. There are many variation of this kind of kites and this is a typical one. There are another "Bee-kite", "Dragonfly-kite", "Cicada-kite", "Horsefly-kite, "Kite-kite", "Owl-kite" , "Crow-kite" , etc. Chochin is Japanese lantern and this kite resembles chochin. DARUMA means Bodidharma, ancient great Buddhist. He prayed during nine years on the stone table without moving. His legs and arms has vanished. 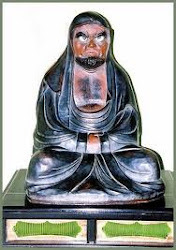 You can see variety of painting of Bodhidharma at a shrine or a temple in Japan. A long single tail is needed to fly this kite. The birth of this kite is Hatano city, Kanagawa prefecture. Today, Edo-dako is designed so as to be assembled at the flying site because of convenience for handling. The number of bridles of Edo dako are 11 or 14 and each length of strings is about 20-25 times of its height. It is very difficult to adjust the center position of strings for good flight. It is famous for its large hummer on the top of kite. This kite is fit for the wind speed of 5 m/second - 15m/second. 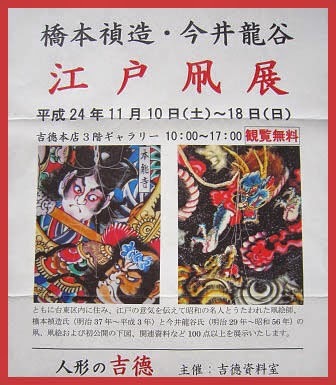 The works of Teizo Hashimoto are shown. A hummer is fixed on the top of kite and sounds with wind. Eto means the twelve horary signs in Japan. Each year has own symbol of Eto, and it appears every twelve years. It is called as Ne(Mouse), Ushi(Ox), Tora(Tiger), U(Rabbit), Tatsu(Dragon), Mi(Snake), Uma(Horse), Hitsuji(Ram), Saru(Monkey), Tori(Bird), Inu(Dog),I(Boar) in order. 2001 is the year of Mi(snake). Those kites were built by late Teizo Hashimoto as memorial kites for each year. Ezo means Hokkaido district which is located northern part of Japan. This kite was designed in 1968 by Mr.Hikoso Ohta who lived in Hakodate, Hokkaido where was called "Ezo" formerly. FUGU means a globefish which has globefish poison. The face of this kite resembles a globefish and has a humorous look. It is very difficult to fly without tails. This kite was originated in 1961 in Shimonoseki, Yamaguchi prefecture. Shimonoseki is very famous for production of globefish. It has an hole for wind in the center of kite which resembles with a Korean kite. This kite is delivered to neighboring people for praying getting rid of evil and unhappiness of a man or woman whose age is 42 years ord ofr man or 35 years old for woman. FUKUSUKE is beleived as a symbol who brings happiness and prosperity to people. He is sitting with wearing Kamishimo (old stype Japanese formal dress). Goryoukaku means the old historical memorial of castle which locates at Hakodate. This kite was originated by Mr.Hikozo Ohta. HACHI means a bee and I think that the shape of this kite came from eastern Asia like as Malaysia, or Indonesia. This kite was originated by Mr.Hikozo Ohta. - kite is called IKA in Hakodate / Hokkaido. Hata is build at Nagasaki Prefecture, Kyushu. It does not look like other Japanese traditional kite in shape. It is beleived that this kite is imported from fareast Asian counties,such as China,Thailand and Indonesia. Nagasaki was the only one harbour when Japan closed to foreign contries during Edo period(1603-1867). It is fairly certain that Nagasaki Hata fighting kite is a derivation of the Indian Fighter. It bears a close resemblance to the classic Indian Fighter, differing only in the absence of the Indian support fin at the tail, and in having its two leading edges supported by guidline of string, while the Indian version has its leading edges unsupported. Nagasaki Hata is traditionally coloured red, white and blue, in the manner of the Dutch ensign. This is an exceptionally manoeuvable kite capable of flying at amazing speeds with consideerable directional control. Equipped with cutting devices such as porcelain glued to the line below the bridle be means of egg white, rice or other natural adhesives, it is a fearsome opponent in competition. Please refer toMaking Process of HATAwhich is shown with 20 photos. This kite is made in memory of fire prevention and a kind of Yakko-dako. This type of kite has sleeves to catch wind. Sleeves have function to stabilize its flying feature. It is better to have tails to get more stability. 'HINODE' means sunrise and tsuru means a crane.Tsuru is one of the symbol of auspicious event and long life. Hitodako was born in Akita prefecture.It has a large figure of man on the face of the kite. Inmyojidako was generated at the beginning of Meiji era, about 130 years ago. It is the special feature that this kite has no slant frame . 'Itsuwa' means five rings. This is a simbol of happiness and prosperity. This kite is strongly influenced by Chinese kite and is made in Kagawa prefecture of Shikoku island. Iwaidako is the celebrating kite. Japanese character (Kanji), "crane"　which means the symbol of a long life is drawn on the kite. 'JI' means the character and JIDAKO means the kite which is painted with Japanese character usually and the character of this kite shows "dragon" in Japanese character. In Japan many kinds of kites are painted with Japanese characters which means happiness and the name of child. Kame means a turtle. It is a special feature of this kite that the corner of the kite is cut away. 'Karakasa' means Japanese umbrella which is made by bamboo and Japanese paper painted with oil. This kite was born in Nagasaki, Kyushu. 'Kintoki' means a hero who appears in Japanese old tale. KERORI has very curious shape and it is rather difficult to keep its flight stability without tails. 'Kintoki' means a hero "Golden Boy" who appears in Japanese old tale. 'KOMA' means a spinning top. The shape of this kite is between Rokkaku and Kaku dako. Its flight feature is excellent and does not need any tail to fly. KORYU-SEMI has a very excellent feature to fly stable at strong wind speed at 8-15m/sec. It is very difficult to build KORYU SEMI because it needs a special sooty bamboo for its frame, Washi(Japanese paper) and excellent technique and experience to build. KORYU means old style and SEMI means a cicada. Great Works of Nagoya Koryuis shouwn in another special page. Machi means town and Jirushi means symbol. This kite is a kind of symbol of a town. Kite fighting festival in Hamamatsu is held among towns on May evry year. Those 168 towns have their own kite to fight. 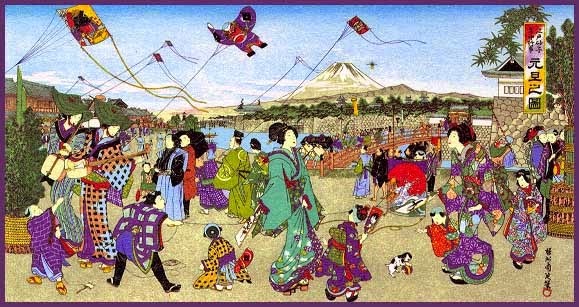 Refer to the page on Japanese Kite Festivals. This kite was born in Marugame, Shikoku island in Japan. The shape is Japanese traditional "Daruma" which has a unique face and pattern comparing with other Daruma kite. This kite was born in Okinawa, southern island, Japan. The shape and painting of this kite is geometrical pattern which we cannot find anywhere in Japan. Managu means eyes.This kite is painted only Sumi, Japan ink. The flight feature is very excellent. Noshirodako has a feature having two vertical frame and four horizontal frame. It has no frame at the bottom of the kite. This kite has been inherited since Ede era in Kariya district, Kannonji city, Kagawa prefecture. Ohgi means a folding fan. It is unbelievable that Ohgi kite can fly in the sky. 'OHJI' ia a kind of Yakko dako. It needs tails to fly stable. 'Oki' is a name of island Oki no Shima, where this kite was born. This kite has very strange shape comparing with other Japanese kites. This kite is made in Hirado, Nagasaki prefecture. This kind of kite is called Noshiro dako. This kite has two vertical spars and three horizontal spars. The construction of the kite is very peculier shape. 'ONNA' means woman and 'BERABO' means ridiculous. It has a humolous painting. There is another OTOKOBERABO, and 'OTOKO' means a man. Rokkaku means hexagon, and is famous for its excellent flight feature, stability and simplicity of the construction among Japanese kites. This kite was bone in Sanjo, Niigata prefecture, northern center of Japan and is also called as Sanjo-Rokkaku. Today, this type of kites made by variety of materials are seen around the world. Any size can be built and its flight feature is very stable at any wind speed. All photos of kites which participate Sanjo kite festival are introduced. Kite festival is shown on the page of Giant Kite Festivals in Japan. 'SAGARA' means the district of Shizuoka prefecture, and this kite was born there.Typical twenty kites are shown on the page of SAGARA. Sagara kite was born in the early eighteen century.This kite has two bridles and no tail and a kind of fighting kite. 'SAKAZUKI' means wine cup. This kite exhibits a very stable flight even if the shape is peculiar. 'SEMI' means a cicada in Japanese. 'SHOGI' is a kind of Japanese game like a chess and this shape resembles with a piece of Shogi, like as King of chess. This kite is born in Chigasaki city, Kanagawa prefecture neaby Tokyo. It needs a long tail made by rope and needs strong wind to fly. It has a small hummer on top of the kite. The shape of Sode-dako resembles Japanese kimono. Sode means sleeves of Japanese Kimono. This kite has a large hummer on the top of kite. It needs the strong wind to fly this kite stable. This kite is build and fly to pray new born boy's future happiness and their health. SUMIYOSHI-dako has been handed down over 500 years ago. This kite was used as a signal in war time and was born in Yoshida-cho, Shizuoka prefecture. SURUGA-dako has the special features that the both side of the kite has a branchia. This kite can be build from square paper sheet without any idle by cutting. This kite is made in Shizuoka prefecture. This kite is made at Sendai, Miyagi prefecture. The shape of the kite resembles dried a cattlefish which is the famous product in this district. 'TAMETOMO' is a famous warlord who lived in the end of Heian era (794 - 1180). He was sent to Hachijo island for his crime and this kite is said to be the memory of his name. The design of this kite is separrated into three parts. The cirkle part of the top of kite means the crest of the owner of Yokosuka castle. The two diamond shaped lozenge shape located at center part of the kite means the family crest of Takeda who is the famous warrior. The folding fan located at the bottom of the kite means means the simbol of Tokugawa shogun.The design of this kite tells about the war on which those three famous Samurais fought. 'TONBI' tombi, means a kite. This kite is also called as Rokugou Tonbi. Rokugou is the birth place of Tonbi kite and south-west district of Tokyo. 'TONGAI' and 'ATAMAKIRE' are relatives for its shape and birth. These kites are for wishing good fortune and health of family. The simbol of happiness such as crain, turtle, pine, bamboo, plum tree and top shell is drawn on the kite. The red color which is the simbol of happiness occupies more than half of the face of kite. This kite is flew at the event of the celebration. The square-sailed TOSA dako is similar to Franklin kite, Delta or HATA. It might be the delta's true ancestor. It is popular that the painting on the kite is the crest of the family. The kite takes its name from the vast bay of Tosa on the south side of Shikoku island, within the Kochi prefecture. Detail description about TOSA dako is offered with beautiful pictures on "Kite Lines" Spring-Summer 1997, Vol.12, No.3. by Pierre Fabre. The kite takes its name from Tsugaru district, northern part of Aomori prefecture which is the birth place of the kite. This kite is different from other Japanese kites. It has wooden frame instead of bamboo which is usually used by other kites. The painting of Tsugaru is one of the most decorative and impressive kite in Japan. YAKKO-dako is one of the most popular kite in Japan. It is very difficult to fly without tails, so children attach 2-4m length of tails made by cut newspaper or other tape. There are so many bibliographies relating to the history of kites. I will introduce some of them in my book shelf on this page. from "Chinese Kites:Their Arts and Crafts"
from "The Creative Book of Kites"
from the CD "Australian Kiting""Kites. A brief history"
from "The Art of the Japanese KITE"